The shoulder is one of the more complex structures in the body, surpassed only by the spinal system itself. The shoulder joint has more potential movement than any other part of the body and undergoes enormous stresses during a lifetime. The neck, shoulder, shoulder blade, elbow, wrist, and hands form what is referred to as a kinetic chain. This means that each part of the chain depends to some extent on the other parts. Often we hear of a problem with “bursitis”, inflammation (swelling) of the bursa. The bursa is not understood well even among some GPs. Essentially The girdle of the shoulder is made up (in the front) of the clavicle (collar bone), the top edge of the shoulder blade (in the back), which is called the spine of the scapula. Other component parts make up the rotator cuff, and strong ligaments and muscles support and motorise the component parts as you reach, lift, pull and push in day to day life. Under the junction of the collar bone, and the back or top of the shoulder blade is the point of the shoulder where the AC ligament (acromio clavicular ligament) hold the two major parts, the scaffold of the shoulder together. The bursa is a compressive fluid sack lying underneath the junction of the collarbone and the scapula. Between the top of the bursal sack and the junction of the collar bone and scapula lies a muscle called the supraspinatous muscle. 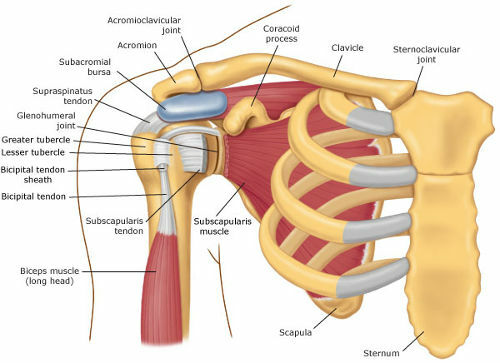 The bursa and the supraspinatous are the two main components in a shoulder injury incident. The nerves that signal the shoulder and arm, and hand to all fingers. Movements come from the neck and run down the arm tall fingers. Please refer to the diagram below to identify these structures. The most common shoulder pain is referred to as an “impingement syndrome”. This is identified as a sharp grabbing localised pain when the arm is placed to the back E.G “It hurts to do up my bra strap Doc”. The bursa can bruise or strains and becomes inflamed. One characteristic of inflammation is swelling and subsequent pain, and when the arm is moved into certain positions the sack literally becomes “impinged” or pinched! Other more dramatic events include ligament and muscle strains and sprains, which are characterised as partial thickness or full thickness tears which may require surgical intervention. Some shoulder pain migrates down the shoulder and into the arm. When we as Chiropractors look at your shoulder we will ask you questions including arm, elbow, and hand pain. From the neck down through the shoulder, arm, wrist and hands we have what is referred to as a “kinetic chain”, and often all these structures are intra dependant. This means symptoms can involve the entire area described. We consider your entire body when looking at your shoulder pain, in particular the nerves emanating from your neck, and believe it or not the pelvis which is where most muscle skeletal nerve problems start. We can help shoulder pain: You can do more movements with your arm than with any other part of your body? Similar to the spine your shoulders, elbows, wrists, and hands perform both complex movements and functions. Because of the high range of mobility in these parts of the body if the joints become stiff, painful or lose their normal movement. Apart from direct shoulder manipulation to restore a small dislocation, we can check all the shoulder support muscles to determine do they have adequate function from their nerve innervation? Small dislocations in the neck and thoracic (between the shoulders), can interfere with nerve function and proper muscle support, function, and balance is compromised weakening normal shoulder function resulting in strains to the muscles and minor tears in the tendons and ligaments. We (Chiropractors) are highly trained in shoulder problems to diagnose and where necessary refer for a steroid injection (thickened/inflamed burial sack), or to an orthopaedic surgeon for further evaluation in the case of full thickness tears, however most pain can be resolved through our treatment including Chiropractic adjustments and soft tissue work to rehabilitate the area of cause naturally.